The Hawaiian Hammer is one of those sneaky drinks that’s got a lot more kick than you’d think. It’s technically a double, with three ounces of alcohol, but because there’s twice as much fruit juice, it goes down smooth. This drink is so named because it’s tropical in feel, but it can knock you over like a hammer. There’s… a bit of alcohol in this one. To be specific, you get three ounces of alcohol in this, and one of those ounces is 151 proof rum. That’s very strong stuff. Fortunately, it also has six ounces of fruit juice to balance that out. So think of this drink as a double. One is all you need if you’re after the feeling of a couple of drinks. This is definitely a cocktail you’re supposed to feel and not just taste. If you’re having trouble finding a 151 rum now that Bacardi stopped making theirs, you can substitute with regular white rum. It’ll be a little less strong, but the flavor profile will be about the same. The Hawaiian Hammer makes a wonderful alternative to traditional tropical rum cocktails, such as the Daiquiri or the Pina Colada. The taste of this drink isn’t quite like any of those, even though it’s similar to all of them. With flavors of banana, coconut, orange and pineapple, it feels like a little vacation in the tropics. That makes it a wonderful choice when you can’t get away, but really wish you could. Even in the dead of winter, this drink can make it feel like summer. Even more so if you dress it up it in this gorgeous multi-colored set of highball glasses I’ve been lusting after. If you want to pair it with food, try this Strawberry Banana Bread from The Recipe Critic. The fruity flavors in the bread and the drink work together in a delicious way. For more of a meal, try it with this Hawaiian Baked Chicken from Diethood. It’s made with pineapple, garlic, lemon, and spices, which makes a wonderful contrast with the sweetness of the drink. The Hawaiian Hammer is great for parties. Most people enjoy it, and you can make it in advance in a pitcher so it’s easy to keep up with refills through the evening. This drink is also perfect for a night of dancing. With six ounces fruit juice, it actually gives you a little dose of vitamins to go along with all the sugar and alcohol. And because you’re dancing, you can work off the calories as you go. 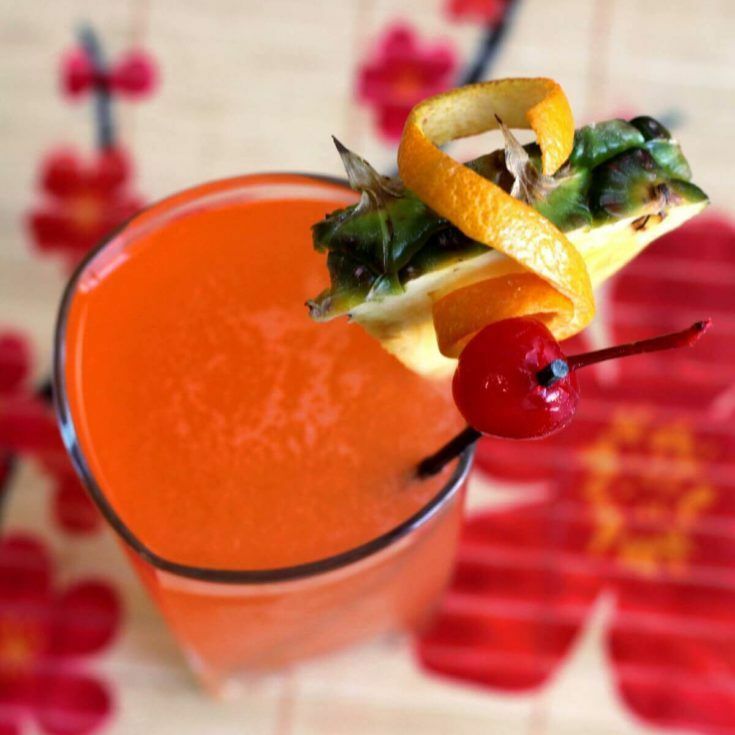 The Hawaiian Hammer is one of those sneaky drinks that's got a lot more kick than you'd think. It's technically a double, with three ounces of alcohol, but because there's twice as much fruit juice, it goes down smooth. Pour in all the ingredients, and shake them until cold. Pour or strain the mixture (depending whether or not you want ice in your drink) into a highball glass. Garnish with a pineapple wedge, orange slice, and/or cherry. What are the ingredient measurements if I want to make a pitcher for a party? This sounds delicious!